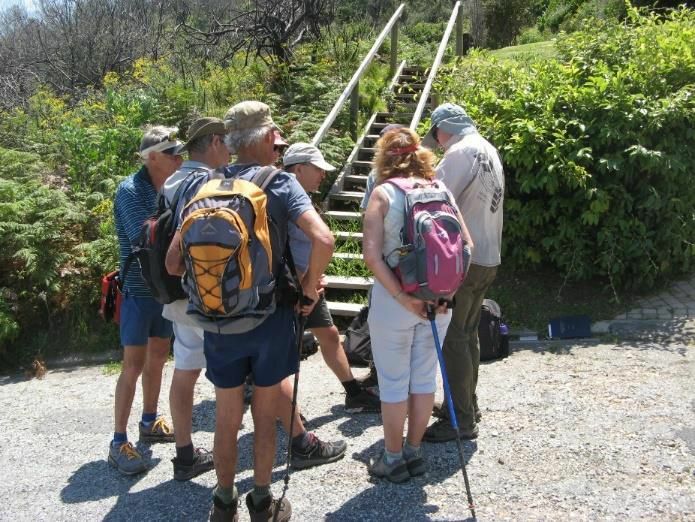 We did this hike last in 2016, before the famous fires of June 2017. During that terrible day most of Brenton-on-Sea burnt down, but now 18 months later, Brenton is as beautiful as ever. 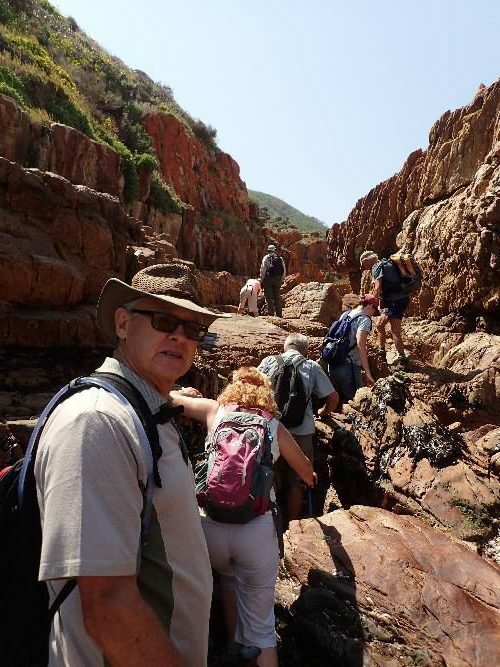 However, I had to modify the route somewhat because parts of the route had become inaccessible due to the path having eroded badly after the vegetation was burnt. 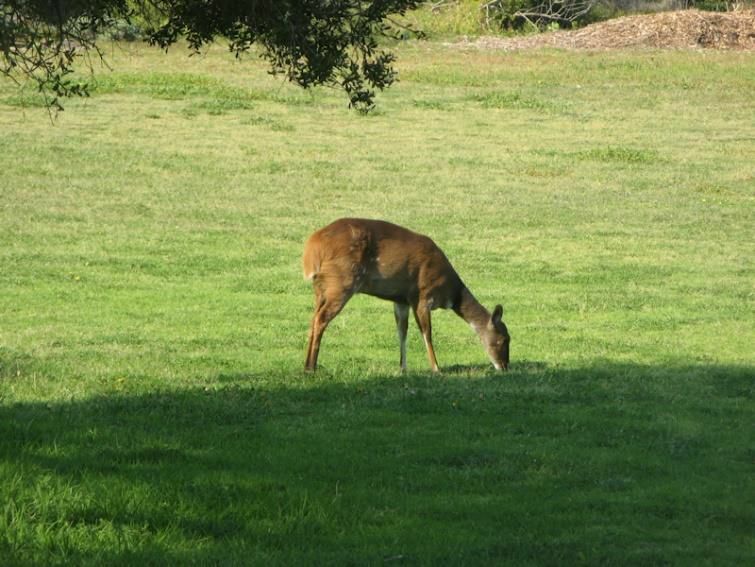 We met at the Nautical South restaurant at Brenton-on-Sea where a pretty little bushbuck female was peacefully browsing on the lawn. Members: Hanna and Dave Edge, Hans van Ameyde, Fred van Berkel, Wolf Schneider, Peter Richmond and Ewa Szewczenko (henceforth known as Ewa with the impossible surname). Guests were Jen du Toit and Kevin Factor. Unfortunately, our esteemed president, Dave Barnes, got his times wrong and was still eating breakfast in Sedgefield when we set of just after 9 o’clock. 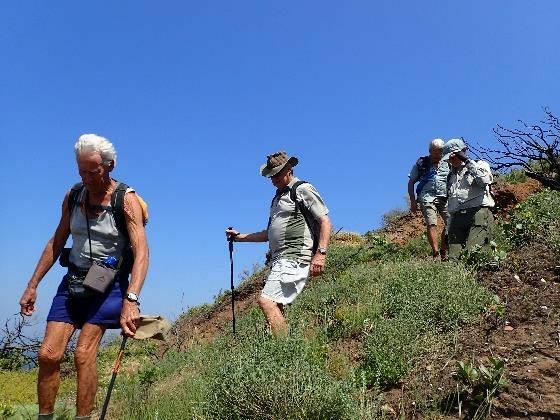 We first went back up the road and turned right into Steenbras Street, where the group photograph was taken from the view site. 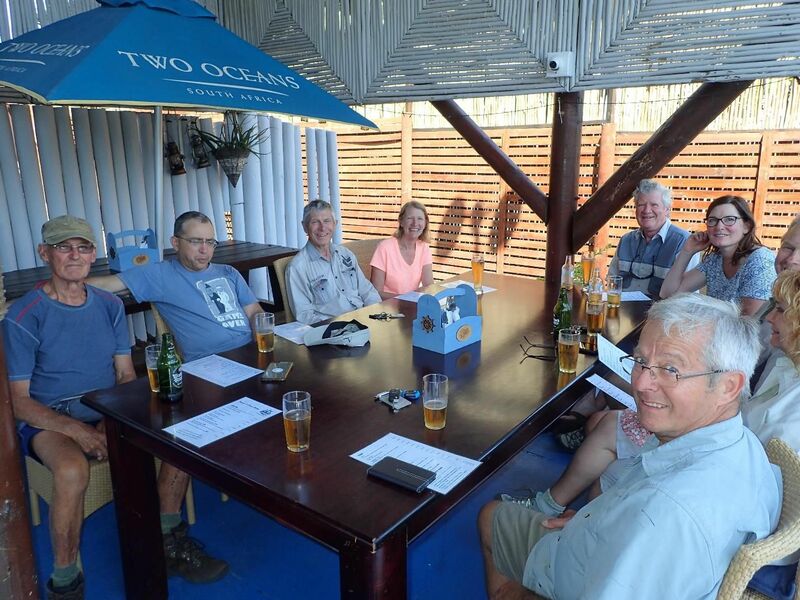 From left: Dave Edge, Jen du Toit, Hanna Edge, Hans van Ameyde, Kevin Factor, Peter Richmon, Ewa, Wolf Schneider. Fred took the photo. 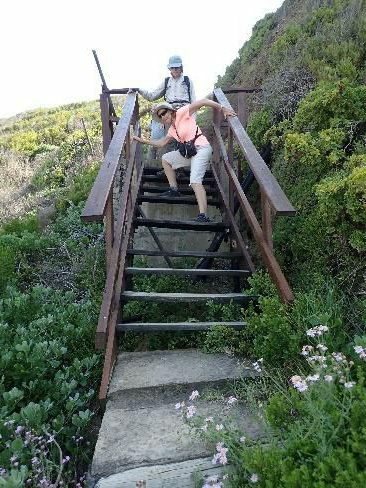 We then descended to the sea via a rickety set of steps, and followed the old fishermen’s path to the east, until we reached our first beach (locally known as Die Blokke beach). 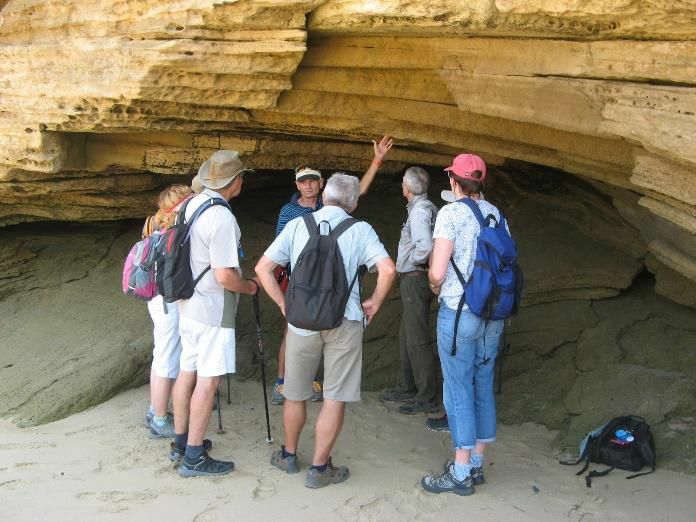 Here Fred gave us an interesting chat about what the coastline looked like 100 000 years ago when the sea was about 30 km further south than what it is today. 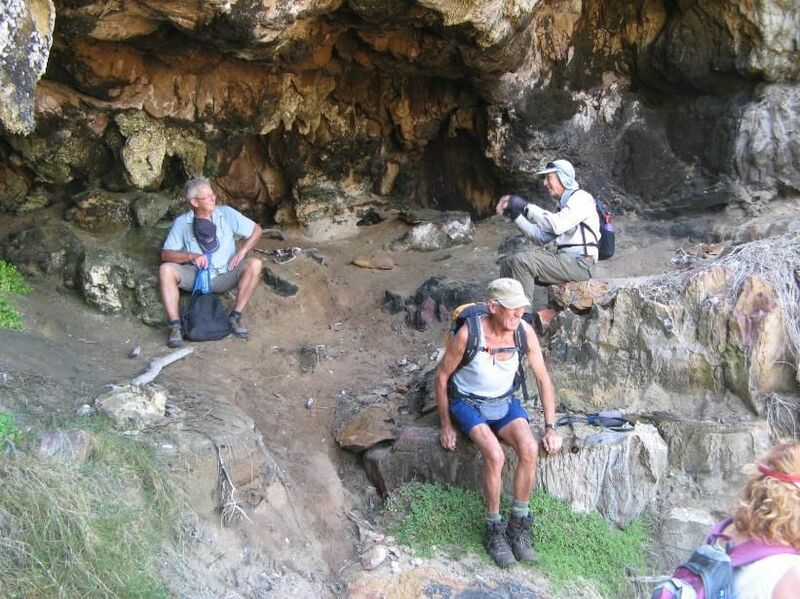 He also pointed out the cave where the 100 000-year-old fossilised hominid footprints were recently discovered, found in the roof of the cave. One couldn’t really see the actual footprints as one has to slide on your back all the way to the back of the cave to be able to see them, and this is a bit claustrophobic. Along the beach it was also possible to see other footprints of animals on the slabs of fossilised dune sand. At the eastern end of this beach are the rocks known as Die Blokke, which are made of Table Mountain sandstone. 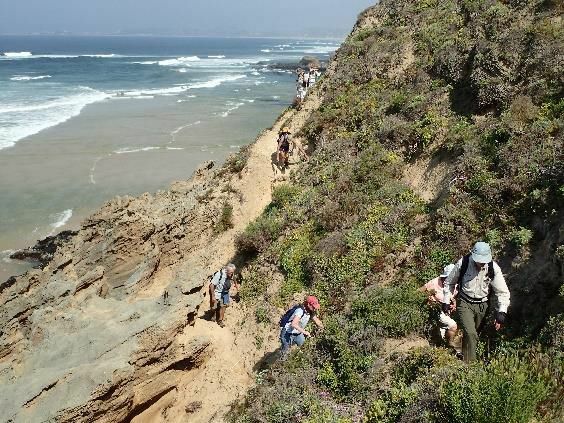 From here Table Mountain Sandstone continues all the way to the Heads to the east, whereas the fossilised sand dunes go all the way to beyond Mossel Bay in the west. Here we climbed back out of the bay using another set of steps until we reached a footpath cutting across the slope below a private housing estate. A little way further we descended again to the next bay, called Vaalkom. The path here is very steep and has a very loose surface, so a lot of slipping and sliding and hanging on to vegetation was done. In Vaalkom we visited a cave a short way up from the beach, which was probably inhabited, and sometimes still is, judging by the amount of black mussel shells around. This was a convenient break for snacks and a drink. 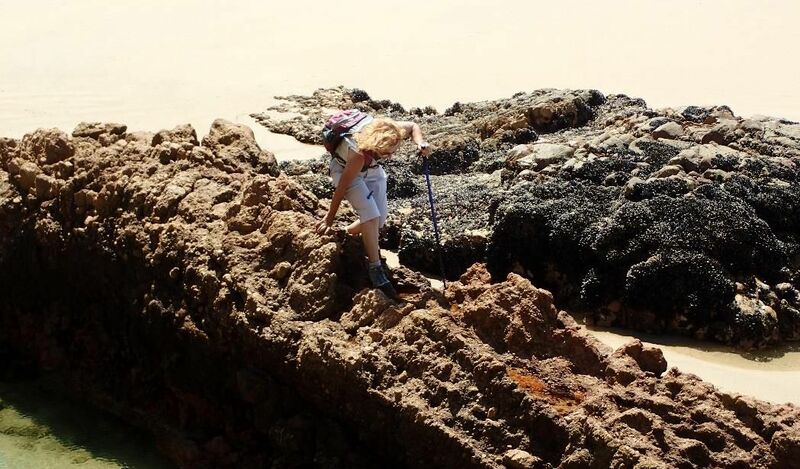 We reached this point exactly at low tide, so it was easy to skirt around some rocks and through a gulley to reach the next bay, where we had to turn around as both the routes out of the bay to the top of the hill were impassable due to soil erosion. To avoid going up the steep, loose path back to the top, we did a detour around the rocks where Ewa with the impossible surname got a crash course in rock scrambling, acquitted herself well and got to the top safely. 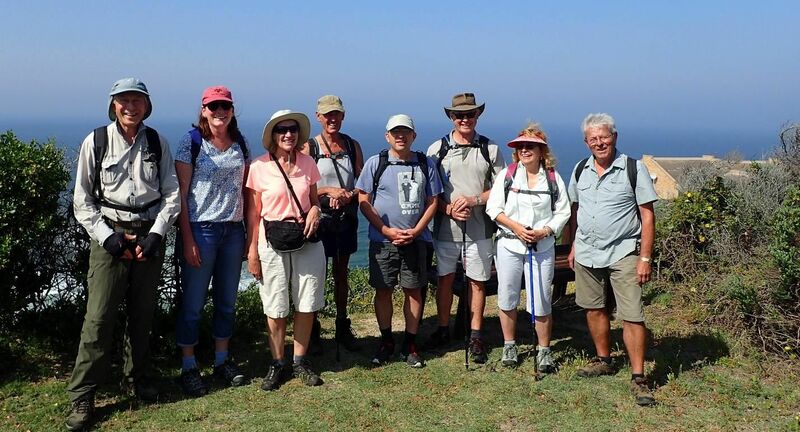 Our next stop was the Brenton Blue Butterfly Reserve, where Dave gave a short talk on the history of the reserve, and the efforts to look after the butterfly. The Reserve burnt down completely during the June 2017 fires, but the vegetation has recovered remarkably. No Brenton Blues were seen yet as it is not quite the right time for them to emerge, but we are holding thumbs. Four hours after we started out we ended the hike back at the little restaurant. 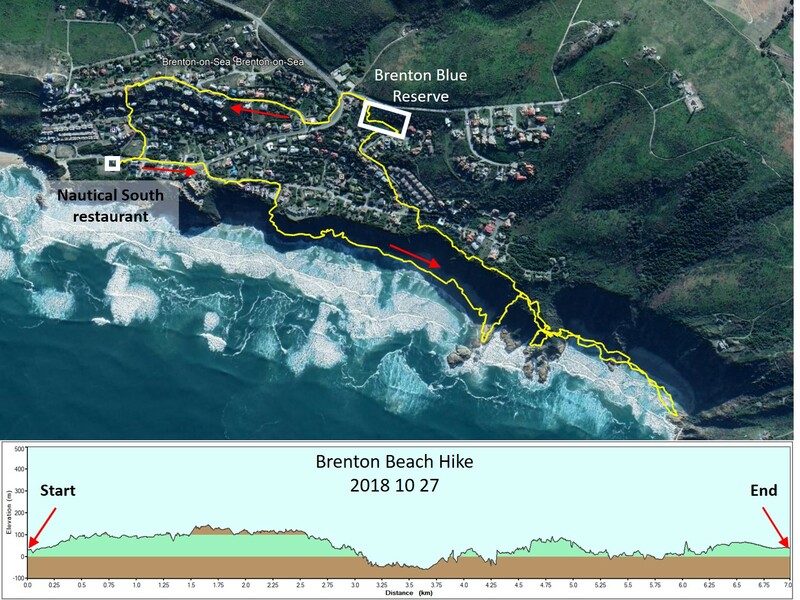 It was a most enjoyable hike and thank you to Fred and Dave who were willing to give us some insight into the geology and ecology of Brenton-on-Sea. Thanks to everyone who came and to Fred for most of the pictures.